I love a good stew, especially as the temperature begins to drop. So imagine my surprise when I learned that many chefs include one of my favorite ingredients when making an Irish Stew! I knew right then and there that this Vegan Irish Stew was going to happen and boy, I was NOT disappointed. Traditionally, Irish stew was made by stewing mutton and root vegetables in a thick and hearty broth. Obviously I replaced the meat with thick slices of Portobello Mushrooms, and used plenty of chopped onions. I also added celery, carrots, baby potatoes, and parsnips to round out the veggies. 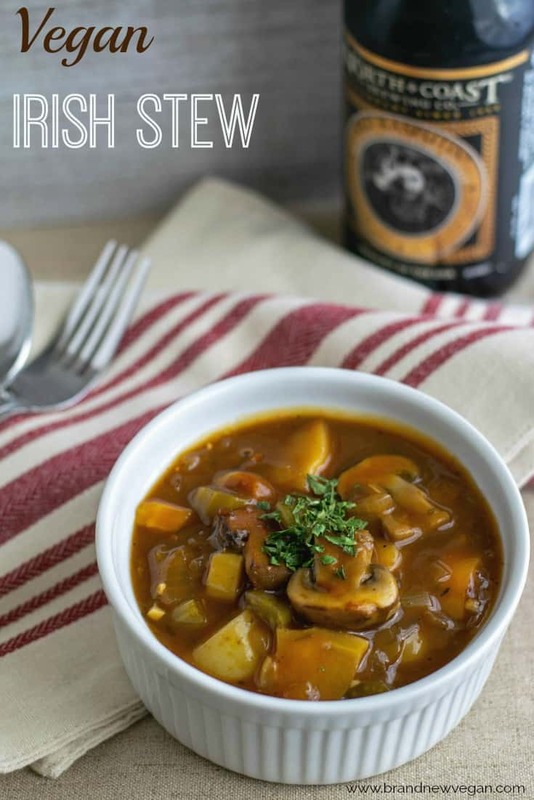 But the broth…..the broth in my opinion – is what really makes this version of Vegan Irish Stew stand out. It’s so rich and flavorful! The secret ingredient is beer. Not just any beer mind you….. but a very rich, dark Beer made famous in Ireland called a Stout. Funny side note: I remember one time at the Grocery Store I had to explain to the young checker what a Parsnip is. Just another clue that clearly we need to introduce more vegetables into our diet – and I mean that literally. I get asked this a lot and I do understand. As I always say when using beer or wine in my recipes, it does add additional depth of flavor and the alcohol does burn off, but do whatever works best for you. In that case, I would say you could try and find a good Mushroom Broth (or Veggie Broth) and add a tablespoon of Vegan Worcestershire Sauce. It won’t be exact – but it will do. 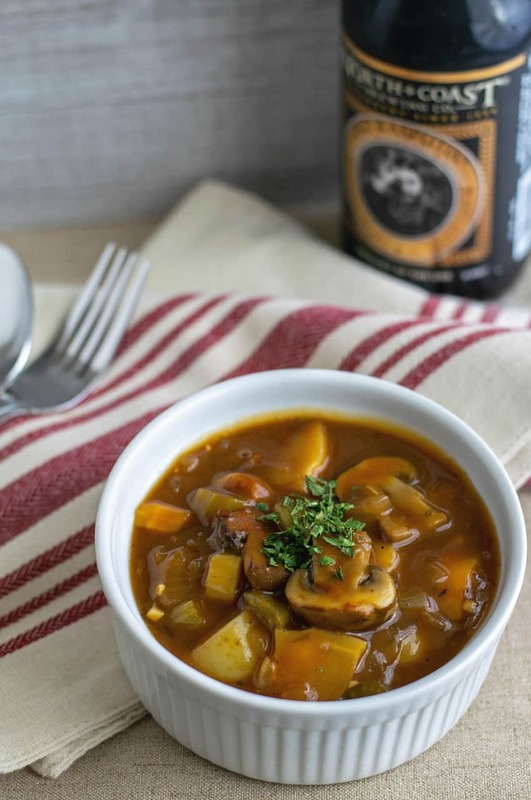 But if you DO make this Vegan Irish Stew as written…… the brand of Stout Beer you use is entirely up to you and/or whatever you can find near you. Because I live in the Pacific Northwest with SO many microbreweries to choose from, I use one of my favorites from North Coast Brewing called Old Rasputin Imperial Stout. But Guinness Stout is also widely available in stores (and made in Ireland) so that would also be a good choice too. Ok so enough with the details, let’s go make some stew. Dice 1 1/2 yellow onions into a heavy stewpot or Dutch Oven and add a tablespoon or two of veggie broth to soften. Next, chop 2 ribs of Celery, 1 large Carrot, and 1 Parsnip and add them to the pot. Let these simmer for about 5 minutes until they too begin to soften. Add 3 cloves of minced garlic and stir that into the mix. It will begin to smell incredible very shortly! Now we add our mushrooms. I used about a pound of Portobello Mushrooms (about 18 small mushrooms). I left the stems on and rinsed them under running water to remove any dirt or grime. Then I cut them in half lengthwise, right through the stem. Add these to the pot and give them a stir. Once the mushrooms begin to shrink in size, stir in 1/4 cup of Tomato Paste and 1 can (or bottle) of Stout Beer (12-14oz). As mentioned earlier, you could sub 1 1/2 cups of Veggie or Mushroom Broth and 1 Tbs Vegan Worcestershire. Finally, add 3 cups of your favorite low-sodium Vegetable Broth and stir everything to combine. The potatoes I used were Baby Potatoes and came in a 24oz bag. I used about 15 baby potatoes (close to half the bag) and cut them in half. Add these to the pot and we’re almost done. To season, add 2 Bay Leaves, 1 Tbs Vegan Worcestershire Sauce, 1 tsp dried Thyme Leaves, 1/2 tsp dried Rosemary, 1/2 tsp salt, and a pinch of ground black pepper. Bring the stew to a slow boil, cover, and then reduce the heat. Let that simmer 10-15 minutes or until the potatoes are cooked through. To thicken, mix 2 Tbs Corn Starch (or Arrowroot Powder) and 1 Tbs water to make a slurry and stir that in. Adjust any seasonings to taste and serve with your favorite crusty bread. 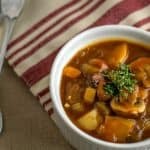 Hope you enjoy my version of this Vegan Irish Stew. If you do, please comment below and let me know how you liked it. If you have anyone who is still on the fence about eating your ‘veggie food’ – this might just be the one to convince them it’s not that bad! 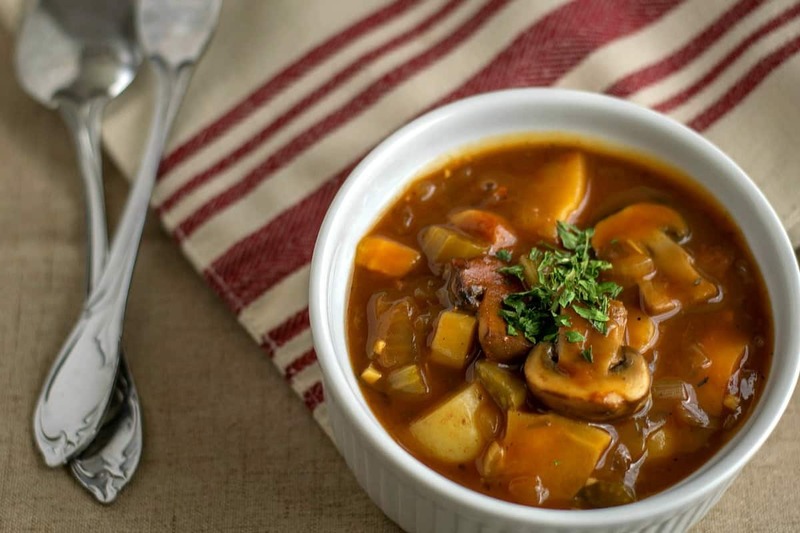 If you love a thick, hearty stew – then this Vegan Irish Stew is for you. Big chunks of Portobello Mushrooms, hearty root vegetables, and an amazing broth make this a real ‘stick-to-your-ribs” kind of meal. Dice onions and add to a stew pot or Dutch Oven. Soften onions in a few tablespoons of veg broth. I’m making the stew as soon as my better half comes home from the grocery store and will let you know how it turns out. As an ND I’ve seen some people who can’t tolerate beer due to a sensitivity or allergy that will do just fine with Marmite. It has that rich umami flavor when using a small amount and that beer/stout like flavor when using a lot. I recommend using the original Marmite, now made by Unilever, since it doesn’t have added sugar, additives, etc. It’s filled with B vitamins and yeast so as a vegan I use it a lot. It’s from the UK and can be purchased on Amazon and locally at World Market and gourmet shops. How much Marmite to you add instead of the stout? Added to my list of recipes to try. I live in California, but my favorite beer is Deshutes Obsidian Stout. I am really looking forward to this meal!!! Do you remove the black undersides of the Portobello mushrooms before cooking them? Hey Chuck! What a fantastic sounding day you had! That’s awesome! I think we all need a recharge every now and then. You were definitely in great company! I had the privilege to spend a couple weeks at True North Health Facility in Santa Rosa a year and a half ago. Talk about a recharge! Chef AJ was there along with a host of our wonderful WFPB Dr’s! I’d like to do THAT recharge every year! Wow! This is so good and rich! I accidentally bought baby potatoes with a mix of red, gold and purple and it made the broth even darker! Loved it! Keep up the good work! I have this simmering on the stove right now and it smells amazing. I can wait until dinner. I just made this – used Marmite per a previous comment, cuz there is no stout or porter anywhere in this desert, lol! But it tastes so good, I’ll probably forgo the search! Neighbors were coming out of their apartment doors, and in from the parking lot, asking what that delicious scent was!! We are more used to Mexican cooking and bar-b-que odors in this neighborhood, the Irish Stew was a surprise for them! It”s going to a widow/widowers Christmas party with me tonight, where I found out they are serving stew – thus my dive into BNV files for a good stew! I like to have control of my own food, no matter where I go. I bet the pot comes home empty – any takers??!! Thanks once again, Chuck, for another delightful recipe! Very good! Thank you so much, I was beginning to think this vegan diet wasn’t for me. I have tried too many recipes that were awful! Finally something I can enjoy! Oh my goodness, we tried this tonight and it was fabulous! Thank you! Cold, rainy night in Kentucky and this was perfect! If I can only find large portobello mushrooms how man do you think I would nee? Can I make in the instant pot and if so what should I change? Thanks! Chuck, this looks amazing! I won’t be having it tomorrow, because I’ve already planned for colcannon and “corned beef” (seitan), but I’m definitely saving this for later! Your recipes never fail to impress! Oh, and for anyone concerned that Guinness might not be vegan, A: their stout has ALWAYS been vegan, and B: their entire line is now vegan after a TREMENDOUS outpouring to become so. If, however, you have any question as to whether the beer you are using in this (or any alcoholic addition to your recipes), check out barnivore.com. They have an extensive database that is constantly being updated and added to. Now that that’s out of the way, let’s eat! Sláinte! I made it with button mushrooms and it turned out great. Very tasty. Could I use fresh thyme and rosemary? I have both. I’m making this today with Irish soda bread. Sure! You may have to adjust the amounts but fresh is always preferred! For the vegans among your subscribers, Guinness is now vegan! I made this last night and it was delicious!!! Thanks for a great recipe, I’ll definitely make this one again. This was amazing! I made it for St. Patty’s Day. I used 14 oz/440 ml of stout and whole 156 ml can of tomato paste. I needed to use more cornstarch to make it thicker. The only thing I will do different next time is start to boil carrots, parsnips, potatoes and yams first. My stove took forever to cook the stew. Slainate! Cheers! How many does this serve? I’ve been obsessed w trying this recipe and am planning to do this stew for a crowd of 20. Do I need to 3x the recipe? Ty!